The Global Multidimensional Poverty Index (MPI) assesses the nature and intensity of poverty at the individual level, by directly measuring the overlapping deprivations poor people experience simulataneously. But who are these people? To answer this question we spoke with some people who were poor according to the Global MPI. We learned about their lives – their hopes and strengths, and their challenges. Naturally their lives are far richer than any measure can capture. You can hear and read some of their stories below. PhubaPhuba is 72 years old and lives with her son, daughter-in-law and their child, her granddaughter, Pelden. Phuba brims with life and walks quickly up the mountain paths with a stick. Though being sick is a worry, Phuba is proud because even at her advanced age, she remains strong. Sangay and MinduSangay is 58 years old and lives in a small Bhutanese village with his wife Mindu and their three children. Sangay is a lay monk which means that, though he has no fixed job, he is always on call, ready to help when any member of the village needs him to come to their home. Sonam is 45 years old lives with her five children. She was married for over 20 years, but her husband no longer lives at home with the rest of the family. She farms her own land and earns money by working on other peoples’ land. This extra income helps to pay for her children’s education. 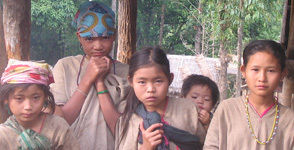 Tashi and JamyangTashi and Jamyang live with their three children in a small Bhutanese village. With their land and work as casual labourers they have enough to eat for the family’s basic needs. However they don’t have enough money to construct a durable house, so they live in a thatched hut. Manuel and LolaManuel and Lola live in the Dominican Republic with their 10-year old daughter. He works as a farmer, selling what he can. She’d like to have a business or trade of her own and says “Life is not good…We need money—not that I need money, but we need money for doctors”. RolandoRolando is 61 years old and lives with his wife, Beatriz. To get by, he picks left over coffee from the ground at a nearby coffee plantation. He picks the coffee that falls to the ground and would be otherwise lost. “I get to it before the rats do,” is how he describes this work.